While I was attending the International Truck Show in September, I picked up an application for a company that hauls bulk fuel products in California, Nevada and Arizona. 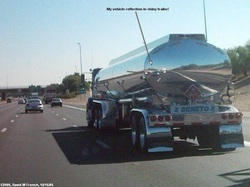 That company is Beneto Bulk Transport. They are based in West Sacramento, CA, but have a terminal in Phoenix. They are well known in the area for their shiny trucks, as in this picture that was snapped on the eastbound I-10 in Phoenix. I applied to them around the first part of October, interviewed a couple of weeks later, and then had to wait until they had another position open in Phoenix. I received a call on December 7th that started me down the road again to become a "Tanker Yanker." My last day with Schneider National is December 28, 2005. Sept 25, 2007: NOTE Beneto has passed into the history of trucking. When Kenan Advantage Group purchased the company from Steve Beneto, they agreed to pay for the company name for a couple of years. In October of 2006, the time had come to transition to the new company name. Any posts after this date will reference the new company name.